I planned to make this Swedish dish after spending the afternoon at IKEA. 🙂 I knew that we could buy the lingonberry preserves for the topping during our shopping spree too. 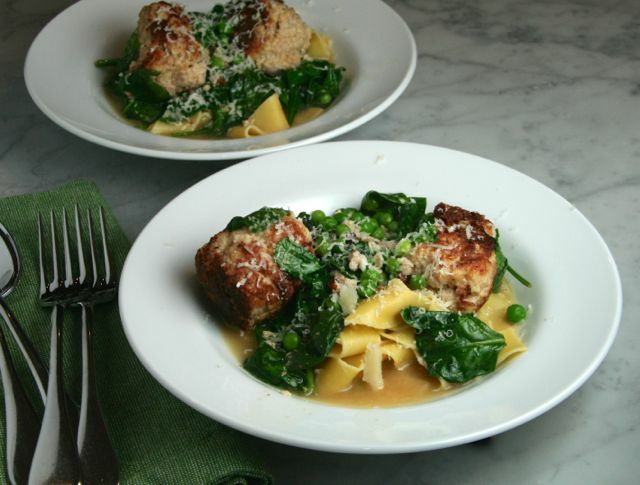 This recipe was adapted from The New York Times, contributed by Sam Sifton. I used a combination of ground pork and ground turkey instead of ground beef. Next time I would double the sauce- loved it. Sifton recommended serving it with boiled potatoes. We ate it with mashed new potatoes (my husband’s request) and roasted asparagus. It was such wonderful comfort food. Great. Shred the cabbage in a food processor. Heat oven to 350, preferably on convection. Put a large pan over medium-high heat, and add the butter. When it starts to foam, add the cabbage and molasses, lower the heat to medium and sprinkle with salt. Cook slowly, stirring often, until all the liquid has evaporated and the cabbage is caramelized, approximately 20-25 minutes. While the cabbage is cooking, lightly mix the meats in a large bowl, then add the onion, cream, breadcrumbs, salt and pepper. Mix again to combine. When the cabbage is done, add about a third of it to the meat mixture, and mix to combine. Grease an 8-inch-square or 8 x 10-inch baking pan, and transfer the meat mixture to it, spreading it out to cover the whole surface evenly. Spread remaining cabbage over the meat, pour the stock or water over the top and place in the oven, on a parchment-lined baking sheet, to cook for approximately 40 to 45 minutes, or until the cabbage is very, very caramelized, almost dry and crunchy at the edges. Allow it to sit for 10 minutes or so before serving. This recipe was adapted from Bon Appetit, contributed by Chris Morocco. I doubled the recipe, used ground pork instead of pork sausage (oops! ), seasoned accordingly, butternut instead of kabocha squash, and cashews instead of peanuts. I also omitted the sugar. I roasted the squash instead of steaming and sautéing it. We let the dish stand alone, but it would also be wonderful accompanied by rice. Delicious! Pre-heat oven to 425 degrees, preferably on convection roast. Toss squash with 1 T olive oil and season liberally with salt and pepper. Place squash on a parchment paper-lined rimmed baking sheet and roast in the oven until tender, about 25 minutes. Let cool slightly. Meanwhile, heat remaining 1 tablespoon of oil in a large skillet. Add pork, 1 teaspoon salt, 1/2 teaspoon ground pepper, red pepper flakes, oregano, thyme, and paprika; cook, breaking into large pieces and stirring occasionally, until browned and cooked through, about 5 minutes. Add garlic, shallot, chiles, and ginger and cook, stirring often, just until softened, about 2 minutes. Add roasted squash, lime juice, fish sauce, and scallions; toss to combine. Serve stir-fry topped with nuts and cilantro, as desired. This is an easy upgrade to the typical Taco Tuesday ground beef tacos. Rick Bayless uses tomatoes and sweet spices to flavor the meat (ground pork) as well as nuts and raisins to add contrasting texture. Delicious! We ate the picadillo in warm hard-shell taco shells with avocado slices, refried beans, steamed greens, and brown Basmati rice. A little sprinkling of feta or queso fresco was a nice garnish too. This recipe was adapted from Rick Bayless.com. When hot, add the onion and cook until soft, about 5 minutes. Stir in the garlic and cook 2 minutes longer. If using whole spices, add the pepper, cinnamon and cloves in a mortar or spice grinder. Add the ground spices to the skillet along with the tomato puree, raisins and vinegar. Simmer until reduced to a thick, homogenous mass, 30 to 45 minutes. While the filling simmers, toast the almonds for about 8 to 10 minutes in a 325 degree oven. Stir toasted almonds into the filling; adjust seasoning as needed with salt. Serve. Note: The finished picadillo can be covered and refrigerated for 3 or 4 days. Classy comfort food! This quick-cooking dish has incredibly tender meatballs and egg noodles basking in a cheesy broth. The spinach and peas make it pretty. What’s not to like? This recipe was adapted from a Food and Wine “staff favorite” recipe, contributed by Kay Chun. I increased the amount of spinach. We ate it over pappardelle noodles with roasted asparagus on the side. Lovely. I’m sharing this tasty dish with Angie and friends for Fiesta Friday #58 at The Novice Gardener, co-hosted by Caroline@Caroline’s Cooking and Elaine@Foodbod. Enjoy! In a large bowl, stir the ricotta and 1/4 cup of grated Parmigiano with the egg, breadcrumbs, nutmeg, 1 teaspoon salt, 1/2 teaspoon pepper and 1/4 cup of water. Add the pork and combine. Form into 12 meatballs. In a large enameled cast-iron casserole, heat the olive oil. Add the meatballs and cook over moderate heat, turning, until golden all over, about 6 minutes. Stir in the broth and the piece of cheese. Cover and simmer gently over moderate heat, stirring occasionally, until the meatballs are cooked through and the broth is slightly reduced, about 20 minutes. Meanwhile, cook the egg noodles in salted, boiling water according to the package directions. Drain and set aside. After the meatballs are cooked through, stir in the peas and spinach, season with salt and pepper, and simmer until the peas are warmed through. 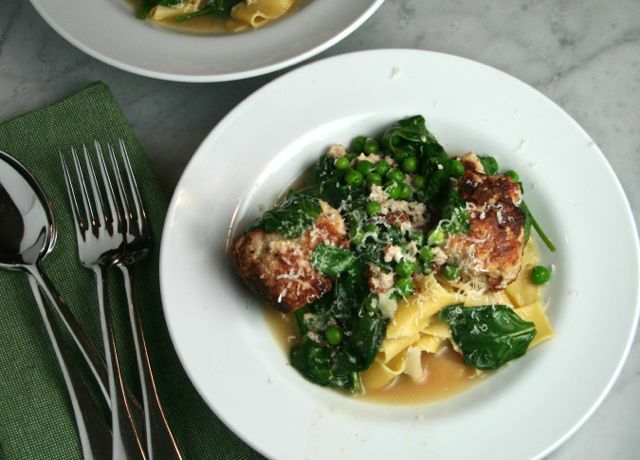 Serve in shallow bowls, spooning the meatballs and broth over the egg noodles. Garnish with grated Parmigiano and serve. Note: The uncooked meatballs can be refrigerated overnight.